In a previous article, I discussed why so many CRM projects have failed. I listed the four assumptions underlying CRM and discussed three of them. This article covers the fourth assumption: that CRM has a positive return on investment. Why is this seldom true? Let’s start with some basic principles. Customers do respond to communications, offers, and promotions. For the communications to work the seller has to have some sort of established business. He has a product or service to sell, and a working distribution channel. For CRM to be used, he has to have a revenue stream (otherwise, where would he get the money to build his warehouse?). The reason for using CRM is to make incremental increases in the current level of sales beyond what is being made now with mass marketing, retail stores, catalogs and database marketing. Somehow, the marketer assumes, if he just knew more about the decision making process in the customer’s mind, he could increase the sales level (to customers and prospects) by as much as 5% or 10%. Let’s say that he is selling some product or service for $150. It could be rental cars, small appliances or carpets. He contacts 20 million customers per year, with sales of $90 million. His current marketing methods involve mass marketing, and direct marketing to customer segments, including a loyalty program. We will assume that of the $150, his net profits per sale are 10%, after deducting all costs including marketing. We will assume a modest CRM warehouse containing data on 14 million prospects and past customers and 6 million current customers. Let us assume that we can build it for $10 million including the software for access, with annual maintenance costs of $1.5 million that includes the cost for the staff, NCOA and appended external data. Amortized over three years, the warehouse will cost us $5.5 million per year. To these CRM or Database costs, we must add the cost of communications with customers and prospects. After all, if we are going to make the right offer to the right customer at the right time, we have to communicate the offer to them personally, or what is the warehouse for? Let’s assume that our firm has been collecting emails to keep the cost of communications down. They have emails on half of all their customers. So with these costs in hand, what will be the result of using CRM or Database Marketing? Using CRM or Database Marketing we have managed to increase the average sale per customer by 10% to $165.00. We may have done this by getting some customers to place larger orders, by getting some to place more orders, or by reducing the attrition rate, or a combination of these and other methods. Sales have increased by $90 million with increased gross profits of $9 million. Unfortunately, when we factor in the cost of CRM, net profits have gone down by $580,000. That is what virtually all companies installing CRM have discovered. Note that these figures assume that CRM is working – that it is increasing sales by 10%. But, in many cases, for reasons shown earlier, the CRM has no such valuable benefit. In the majority of companies, it makes only a very small improvement in the sales rate! It really should not be so complicated. The goal of CRM is to select the right prospects and to get customers to be more loyal and buy more. A warehouse is of only marginal help in doing this. The goals can be achieved by coming up with products, services, tactics, strategies and communications that the customers will like and respond to. The CRM warehouse and software do none of these things. The goal can be realized by building a database, determining customer segments and designing a marketing program for each segment, using personal data from the database for each communication. 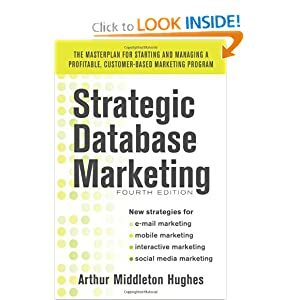 Many marketers are doing database marketing and calling it CRM. They don’t have a multi million dollar warehouse. They are marketing to segments and making money doing it. That is great! But it is not CRM.